Making homemade bread is a kid-friendly and delicious activity, but one Japanese mom’s bread loaf masterpieces elevate the stuff of life into works of art. 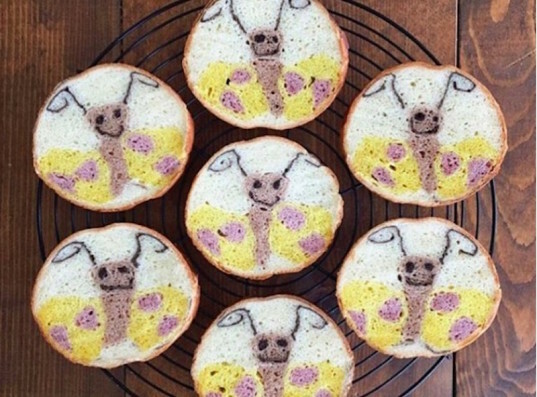 Using her son’s drawings and beloved cartoon characters as inspiration, Instagram user Konel Bread magically bakes up loaves that, when sliced, reveal cheery, wow-worthy images. We say “magically” because we can’t quite figure out how she manages to make the leopard prints, fruit, dog faces, and flowers, but we think Konel Bread’s process must be similar to those beads and pendants made of clay and Fimo that somehow managed to include Jerry Garcia’s face or a leaping dolphin. In any case, these amazing loaves are clearly the product of meticulous planning and careful execution. Her ideas are sparked from and incorporate illustrations made by her child, such as butterflies, and she has fashioned an amazing repertoire of animated characters and figures including Piglet, Snoopy, and Minnie Mouse. The loaves with roses or small flowers are surprisingly elegant, but, she also has a sense of humor, crafting thought bubble bread to which diners or servers can add words. The baker/artisan also has a keen environmental sense, using plant-based ingredients like spinach, beetroot and cocoa to color and flavor her creations. Summer just began, which means you have 11 or 12 weeks to perfect your artisanal and artistic bread skills before it’s time to pack school lunches again. Or you could trek over to Tokyo to track Konel Bread down for some private lessons. If you do figure out Konel Baker’s secret (and it’s something other than being extremely patient and artistically gifted), let us know! Making homemade bread is a kid-friendly and delicious activity, but one Japanese mom's bread loaf masterpieces elevate the stuff of life into works of art. Using her son's drawings and beloved cartoon characters as inspiration, Instagram user Konel Bread magically bakes up loaves that, when sliced, reveal cheery, wow-worthy images. We say "magically" because we can't quite figure out how she manages to make the leopard prints, fruit, dog faces, and flowers, but we think Konel Bread's process must be similar to those beads and pendants made of clay and Fimo that somehow managed to include Jerry Garcia's face or a leaping dolphin. In any case, these amazing loaves are clearly the product of meticulous planning and careful execution.